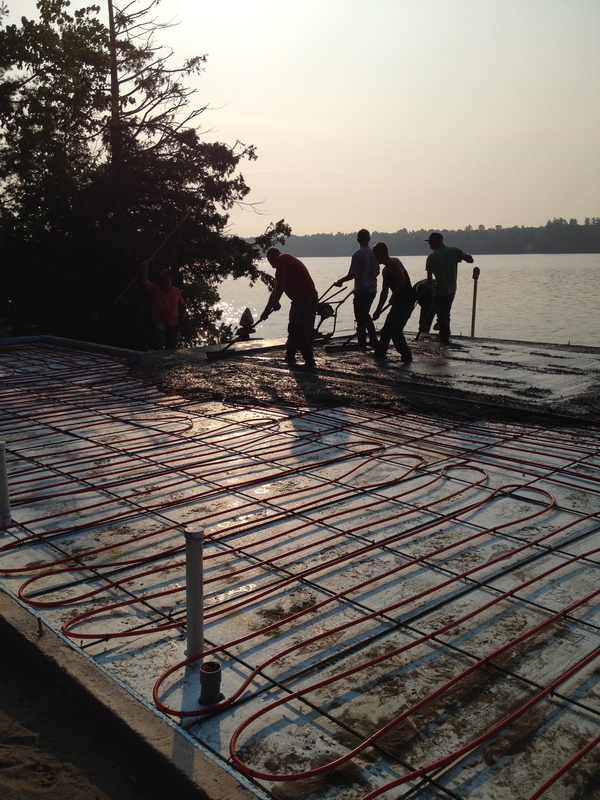 Last week the radiant heat pipes were set into the house. 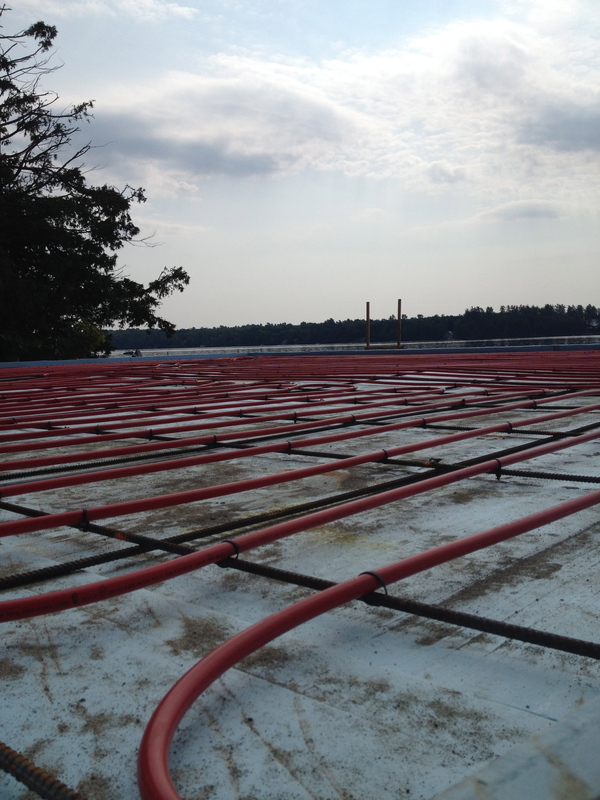 It was fun to see the grid of rebar and the red Pex pipes all in place. Air-tested, no leaks. I can’t wait to walk on them. We also met with a man who will be acid staining the concrete when the house is closer to being done. We’ve decided that we’d like to keep it simple and stain the concrete floors as they are. No tile or other for coverings are needed on the main floor. Upstairs we’ll have wood floors and baseboard heat. We had the privilege of watching two bald eagles fly over our 4th of July picnic down the road. The first one landed in a tree by the house and we listened to the crows squawking and the eagle’s weak peeps. There was another big bird, too. The neighbors think it may be a golden eagle, we wondered if it was an immature bald eagle. But whatever it was, we all were thrilled to watch the big birds on Independence Day. And we’re all so glad that they’re living around our lake. Yesterday Ned saw a big furry something in the lake. He took out the canoe to and found it was a dead raccoon. Bloated and stiff. What do you do with a dead raccoon? We didn’t want to let it rot in “our” lake. He buried it in the yard behind the boathouse. We’ve been having too much fun to blog. We are making progress on the house, however! Today the slab got poured! I marvel at the ability of the concrete truck drivers who can back their huge trucks down our challenging driveway backward with finesse. And the team of guys who, up to their ankles, can spread and smooth wet concrete with apparent ease. A real team. The pouring started at just a little bit past 6:24am this morning. Arthur our wonderful “cement guy” (my lovingly and respectfully coined phrase) was here bright and early to do whatever he had to do and before I knew it, the rumble of the concrete truck could be heard. I had to get dressed for work quickly and grab my coffee so that I could go out and watch the big event. (I dressed so quickly that my underwear was inside-out!) It’s truly impressive to watch the team of men, concrete truck drivers, and Arthur’s team of five (including Arthur) in a time-proven process, communicating in nods and waves. A shovel-full here, half a barrel there and then making sure it’s all level and smooth. Sometimes with a machine and sometimes by hand. Amazing by my estimation. Tonight it’s raining and will keep the slab cool and moist enough to slow the curing process and we’ll have a good, hard four-inch slab on which to build our house. I can’t believe that the next step is to raise some walls. To my eyes, the house looks tiny. Tiny enough that Ned went out tonight to measure the slab. I’m happy to report that my eyes are wrong and it’s just the right size. 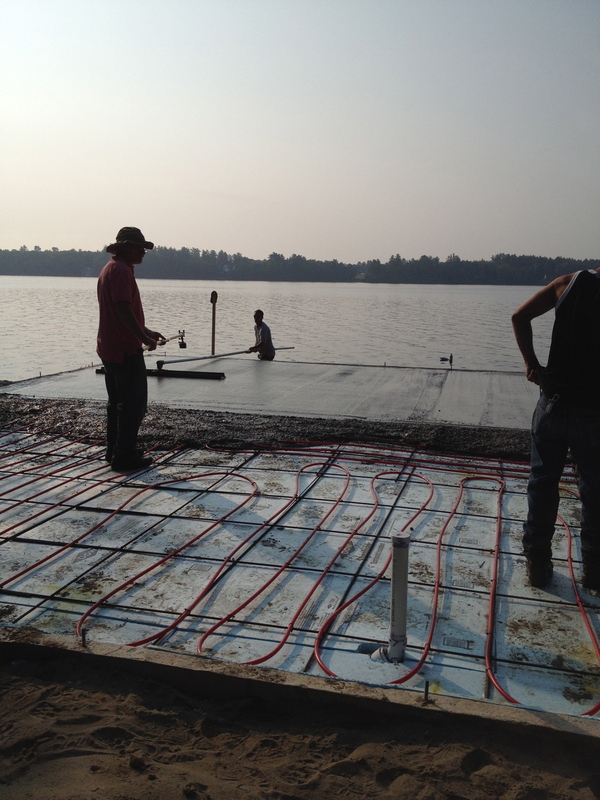 This entry was posted in Uncategorized and tagged 4th of July, bald eagles, concrete, dead raccoon, home building, Maine, Maine life, Messalonskee Chronicles, Pex, pouring concrete, radiant heat, slab, we get to live here, We live in Maine on July 7, 2015 by lindarockwell3.